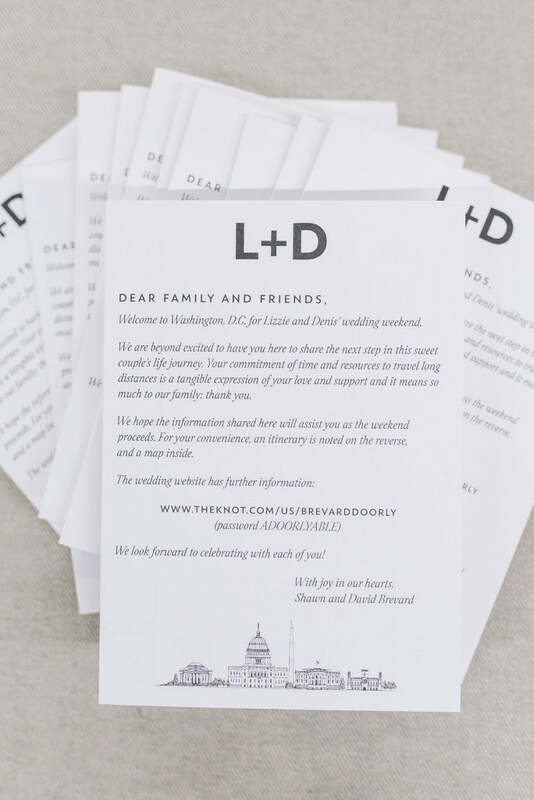 I always say that designing custom wedding welcome gifts is much like a jigsaw puzzle. 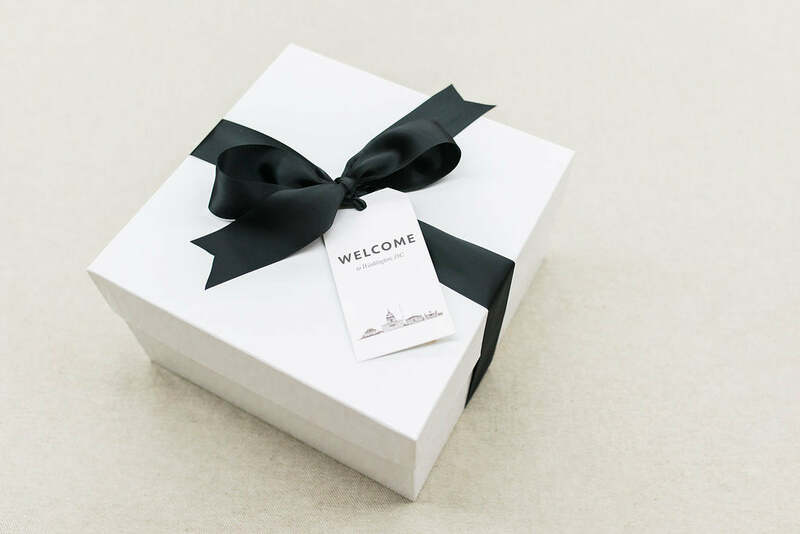 You must find just the right combination of gift packaging and gift contents that are not only useful and appropriate to the occasion, but that also match the aesthetic of the event. 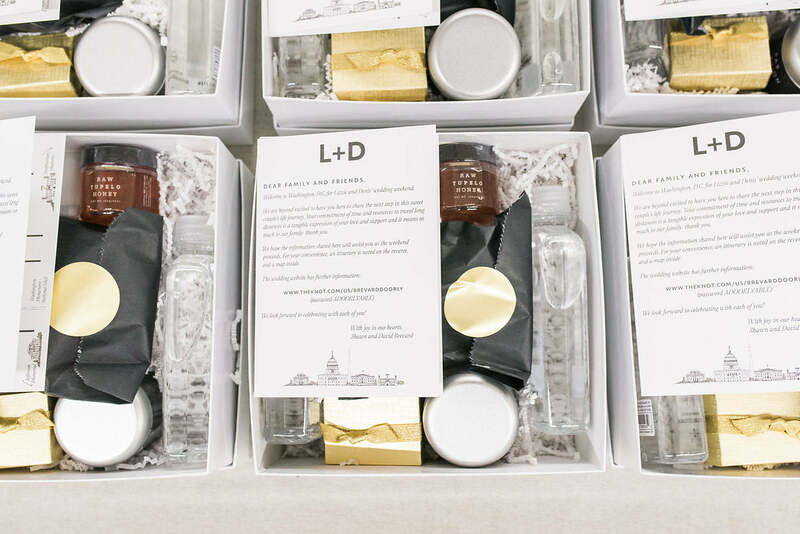 In this case, we were tasked with creating modern welcome gift boxes for a Washington, DC wedding at the Mellon Auditorium, planned by Grit & Grace Events. 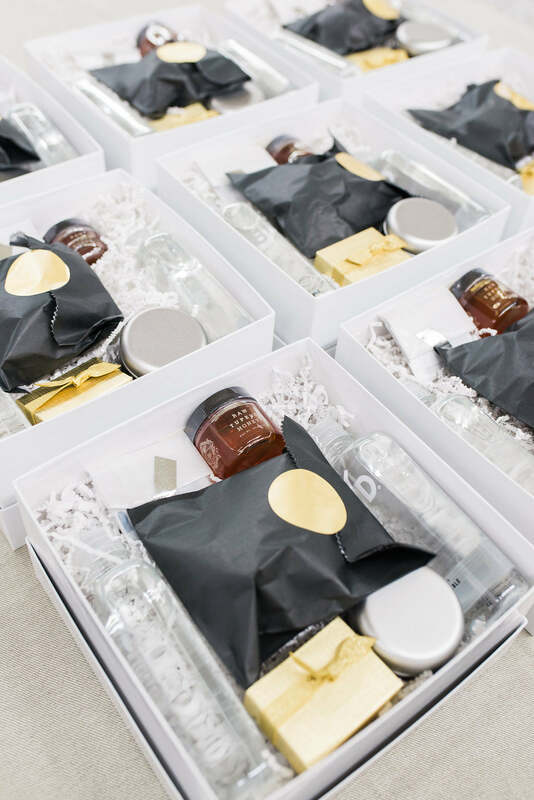 The color palette of the wedding contained tons of black, white and metallics so we made sure that the gifts followed suit. At the same time, we also wanted a breakfast-in-a-box feel that would tell a story about the couple. We began with a pair of cinnascones by Buttercream Bakeshop, packaged with black treat bags and closed with large gold stickers. With the groom'ss family coming in from Ireland, we selected Irish breakfast tea in black and silver tins. With the bride's Tupelo, Mississippi roots, small jars of tupelo honey to enjoy with the cinnascones were an absolute must! We also included gold treat boxes with a pair of "Sloops", a toffee-like candy from the groom's favorite New England candy shop. 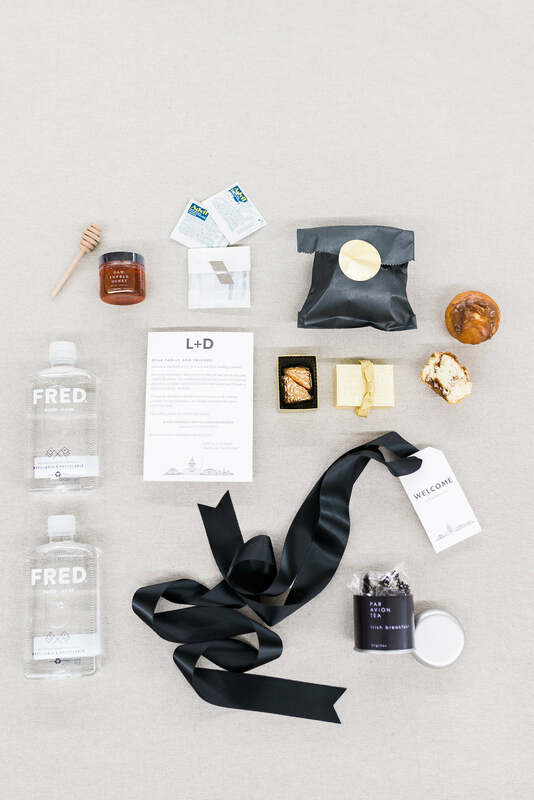 Practical items included FRED water and Advil packets, packaged in mini white treat bags closed with metallic washi tape! 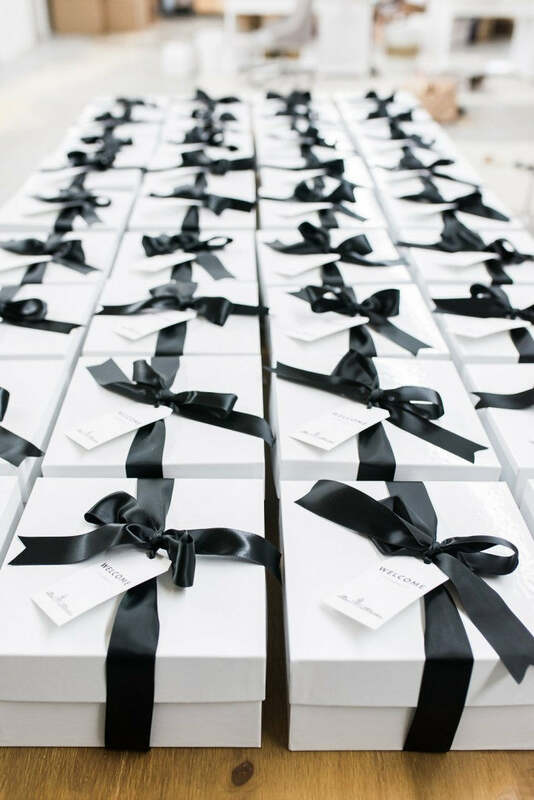 For packaging, we selected crisp white boxes and adorned them with black satin ribbon and custom gift tags by Paper zest. The gift tags featured modern block lettering along with a DC cityscape illustration at the bottom! And speaking of custom gift tags, let's talk about custom paper! Paperzest did an amazing job creating custom walking maps as part of the welcome letter booklets. 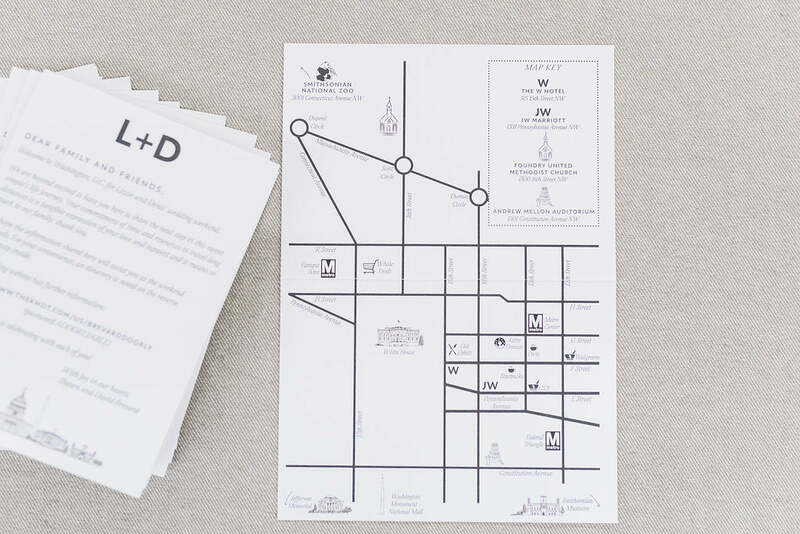 Since most all of the wedding guests were from out of town, it was critical that the maps helped guests not only find the ceremony and reception locations, but also find their way around the neighborhood. 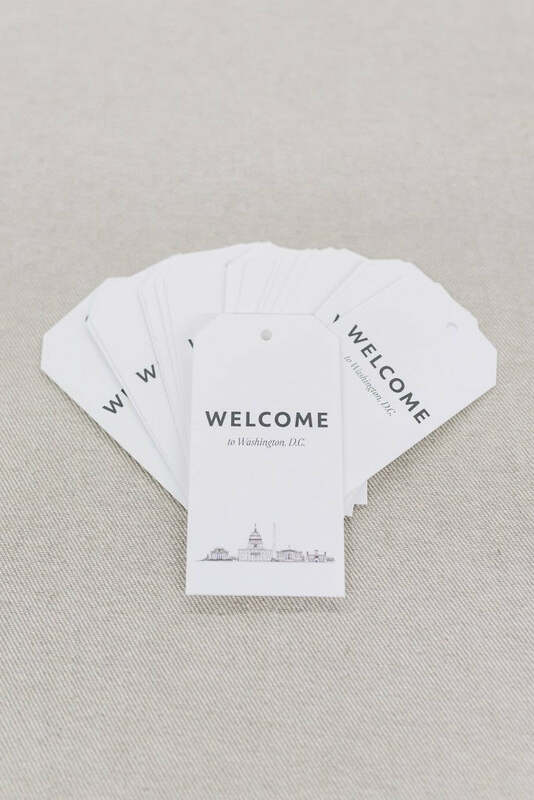 We included the pertinent landmarks such as Foundry United Methodist, JW Marriott hotel and Andrew Mellon Auditorium as well as useful spots such as the closest Metro stop, Whole Foods, CVS, Starbucks and Walgreens. We were thrilled with how these gifts turned out! And because there were one hundred of them, the sight of rows upon rows of gifts was truly something! No matter how many wedding welcome gifts were create each wedding season, I promise you it never gets old. It's no secret that many of the weddings we design gifts for are feminine and organic with tons of blush and neutrals. While we love this look, we are enjoying the chance to design more modern looks this season. What do you think? Let us know in the comments or reach out via our contact page. We'd love to hear from you! 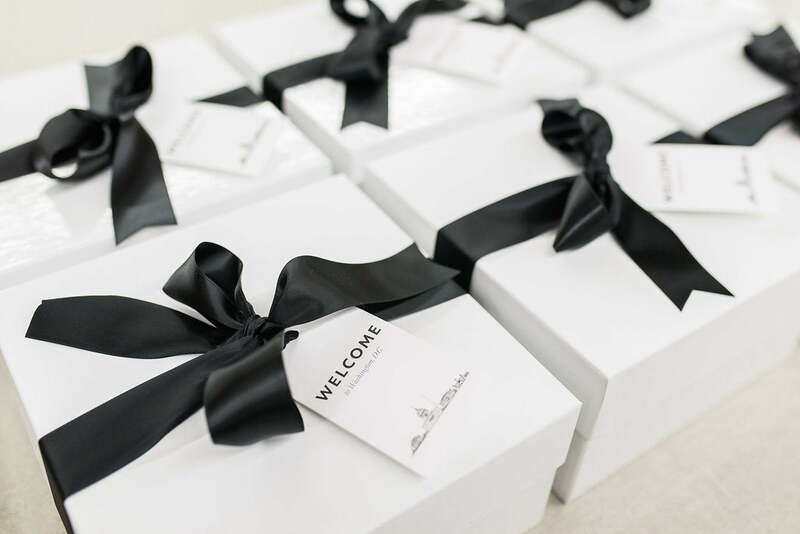 For more information on our Custom Gift Design Service, visit HERE.